We are back from the cold windy city of Mt. Dora's show last weekend, and we heard it was quite windy here too at market, but tomorrow is suppose to be a gorgeous day, with low humidity, mild temps, and even better, very mild breeze ! Thanks to all the hardy folks that came out for Mt. Dora's show, saw some old friends, made some new ones, and despite weather challenges, it was a good show. So many thanks to Christine Cole who runs the whole thing, along with an army of volunteers and the support of the city Admin staff. 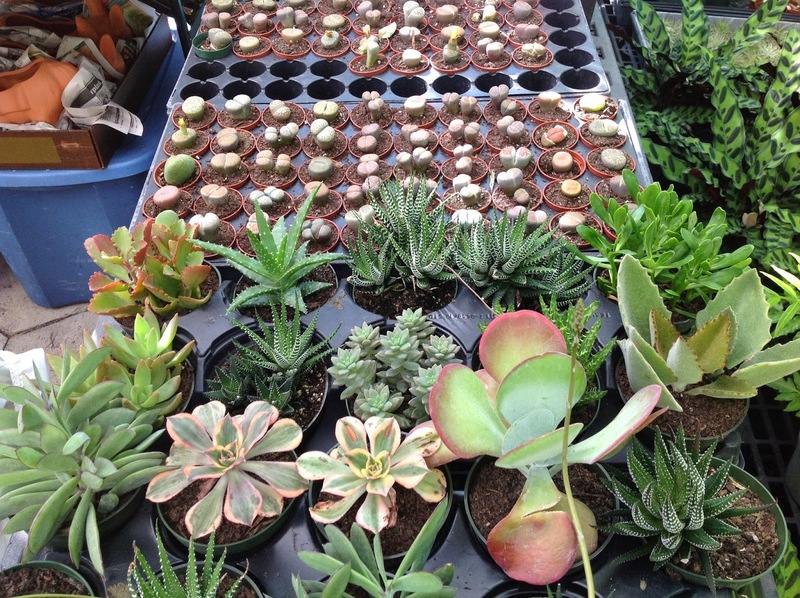 This weekend, we are back at Saturday Morning Market and we are newly stocked with fantastic succulents, cacti, hardy landscape specimens, butterfly friendly perennials and much much more. 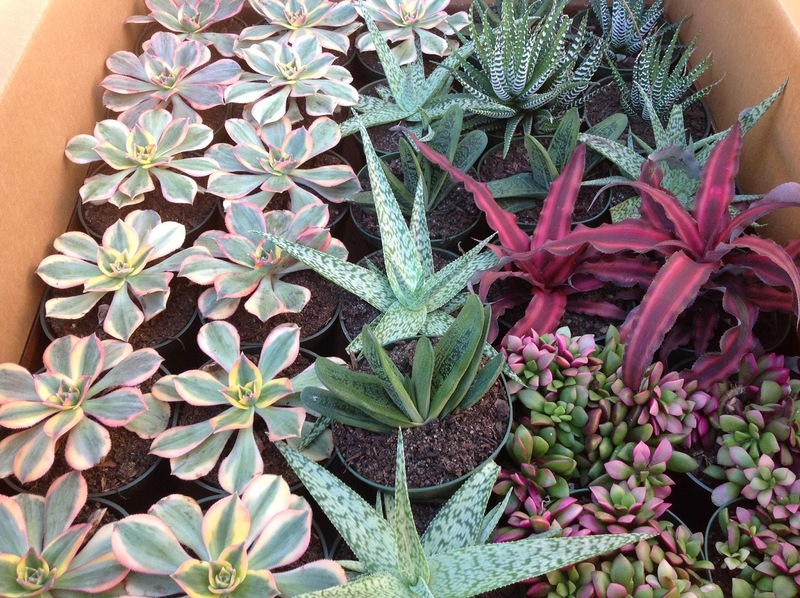 3 and 4 inch succulents are the perfect size to use on their own, or combine in a rock garden, container or on your windowsill. 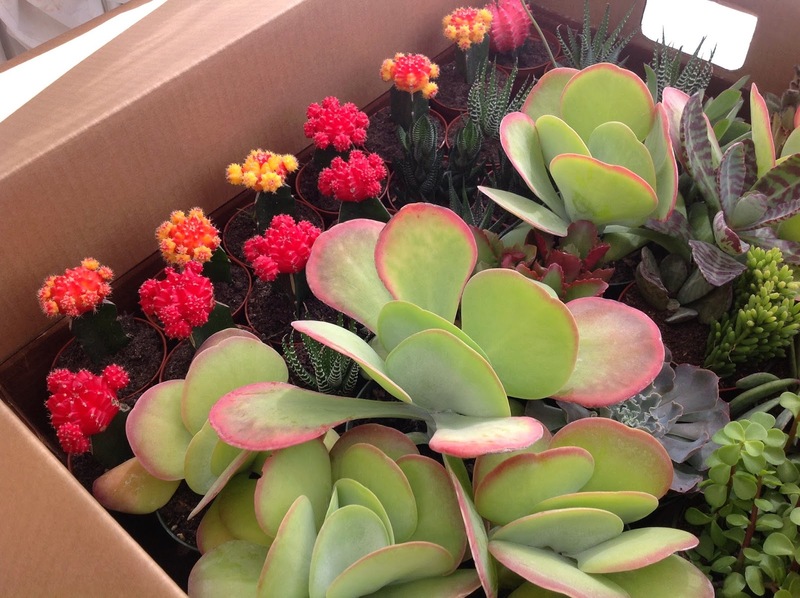 The "Color tops" at right are so bright and cheerful and these are sprouting babies all over the tops. The "Potato Chip" is a popular one, the more sun it gets, the pinker it gets around the edges. At the rear of this photo is the unique "Living Stone", super draught tolerant, they bloom and make babies. 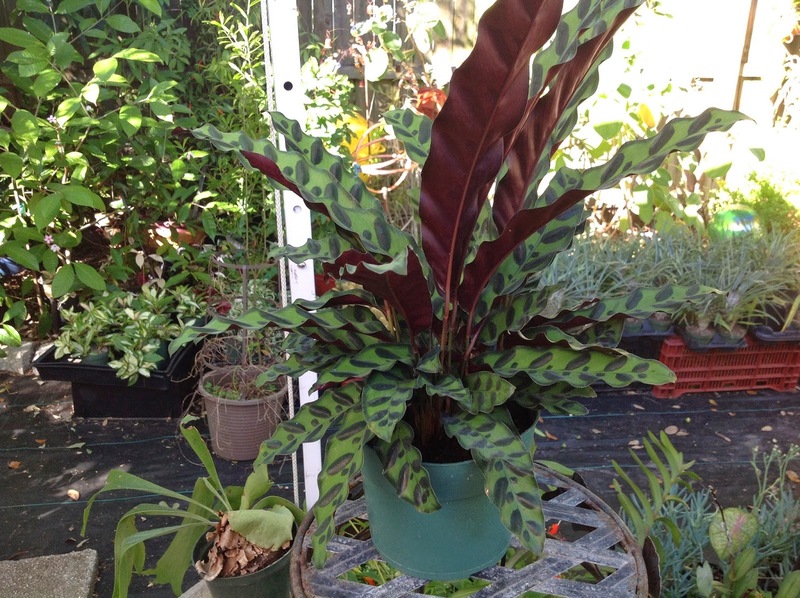 This "Zebra striped" Calathea is a new addition to our stock. Gorgeous striped variegation on top, with a burgundy undercoat. Loving shade and not water needy, you can use it as ground cover in your shade garden, or on your porch. It's also a great house plant. 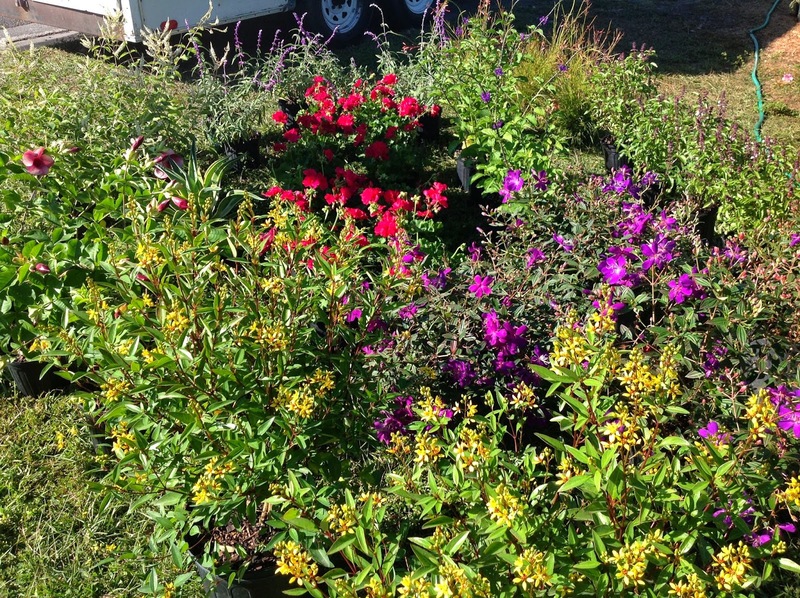 Perennials are the name of the game, especially in Fall, and we have Thriallis, Sweet Almond bush, Tibouchina, African Blue Basil, Porterweed, Firecracker, and included some gorgeous Cherry Jubilee Allamanda vines. Oh, and course, can't forget those geraniums ! 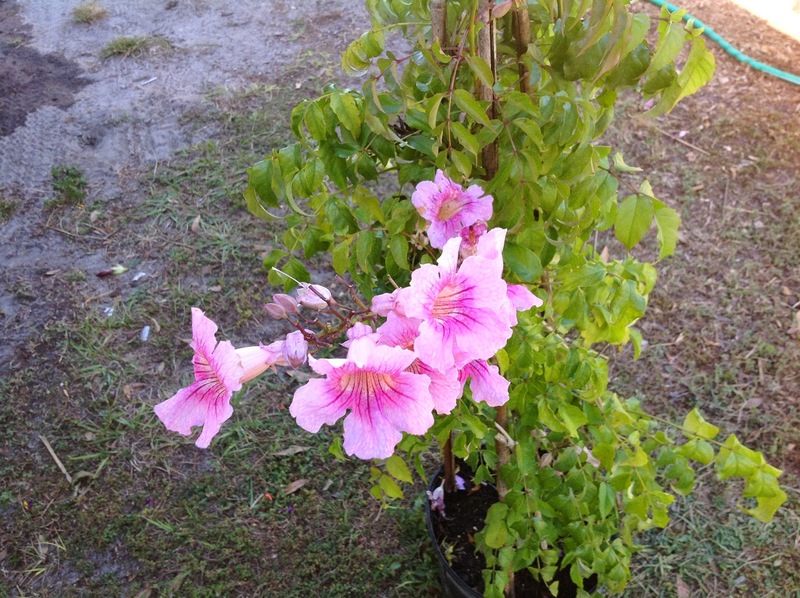 This Pink Trumpet Vine is also a new entry in our stock. Pink, aromatic blooms, it loves sun but will tolerate some shade, blooms in the Fall, and regenerates in the Spring. Just an all around unique vine for your garden.